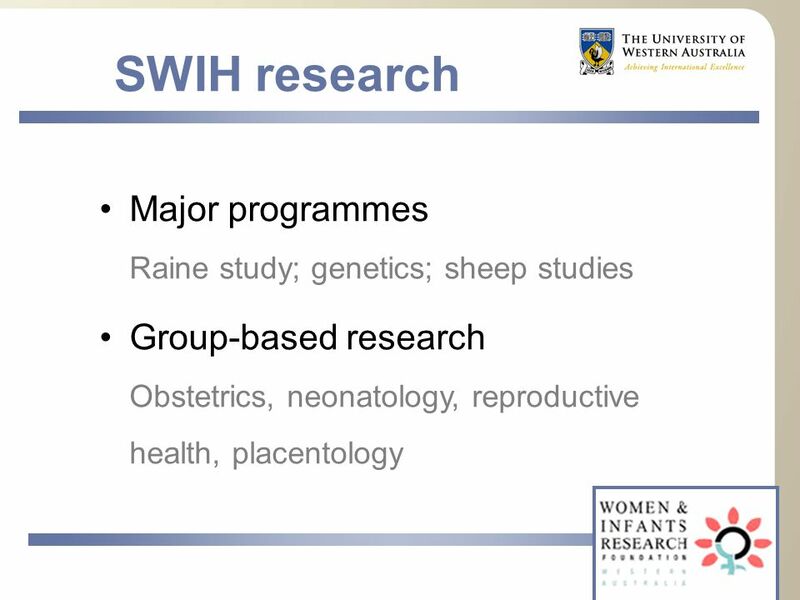 School of Women’s and Infants’ Health Overview of Research by Jeff Keelan. 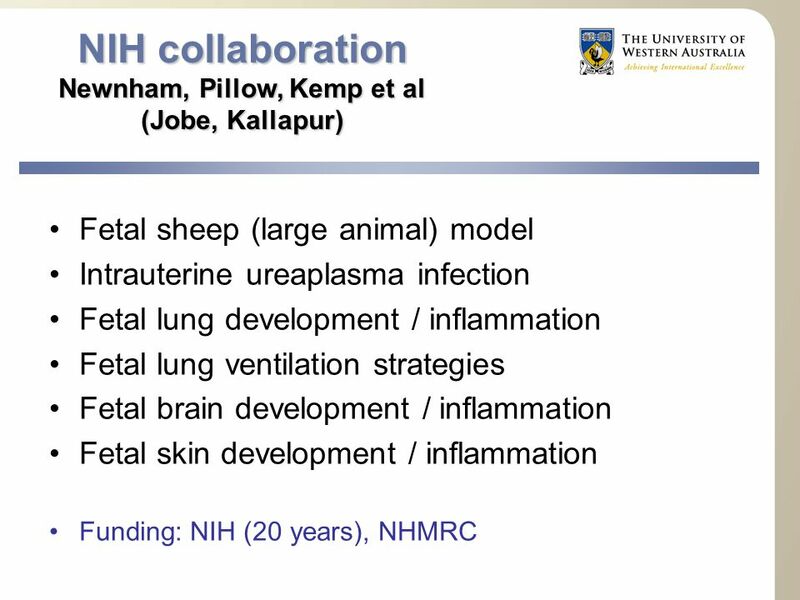 7 Neonatal Research Simmer, Pillow, Hartmann et al Neonatal immune development, infection and late onset sepsis. Neonatal lung function and development – ventilation strategies; diaphragm structure and development; nebulizer-based surfactant supplementation; caffeine therapy; mathematical modeling of lung epithelia during ventilation. 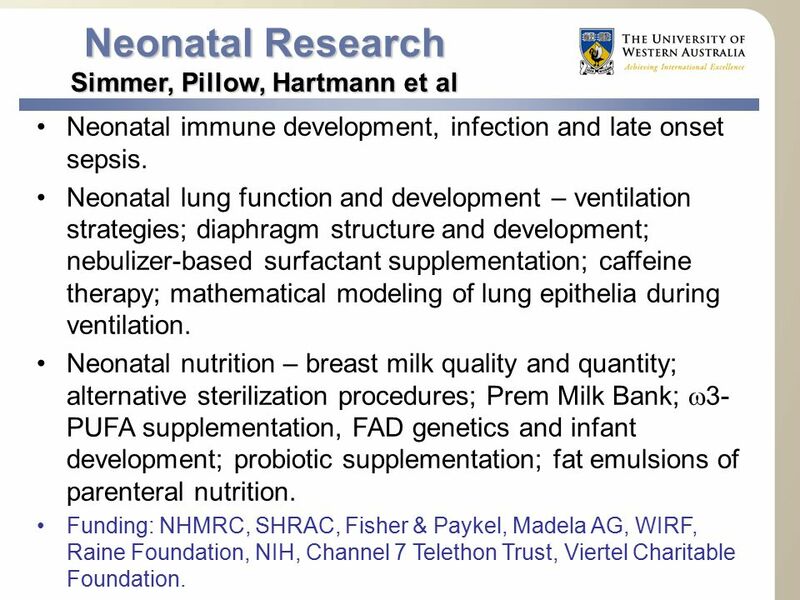 Neonatal nutrition – breast milk quality and quantity; alternative sterilization procedures; Prem Milk Bank;  3- PUFA supplementation, FAD genetics and infant development; probiotic supplementation; fat emulsions of parenteral nutrition. Funding: NHMRC, SHRAC, Fisher & Paykel, Madela AG, WIRF, Raine Foundation, NIH, Channel 7 Telethon Trust, Viertel Charitable Foundation. 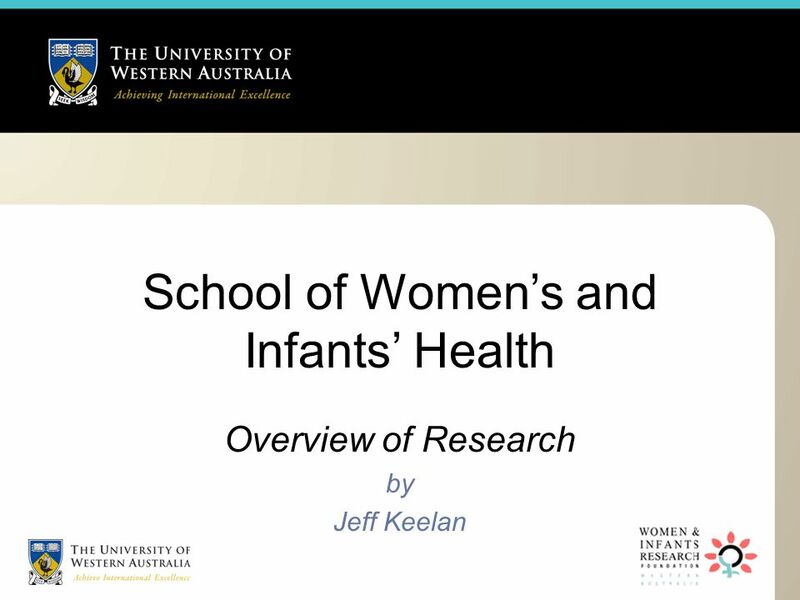 Download ppt "School of Women’s and Infants’ Health Overview of Research by Jeff Keelan." 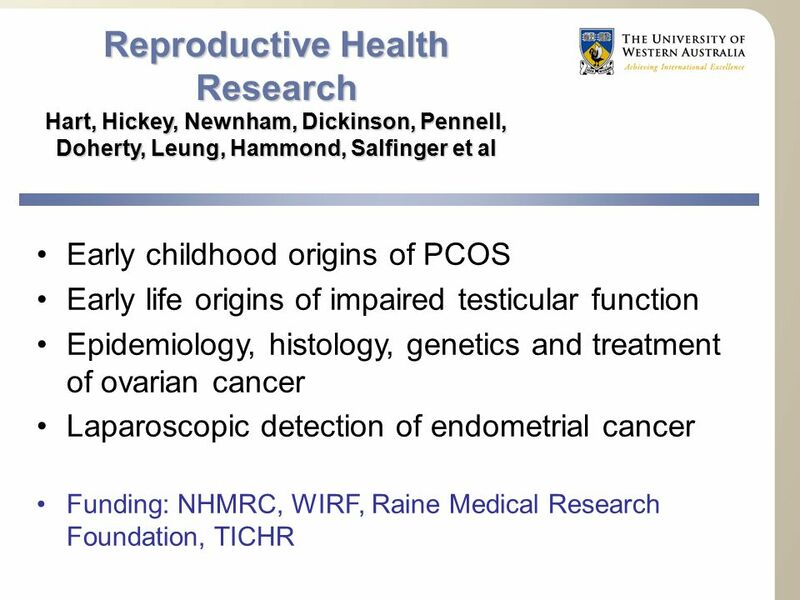 M. Tevfik DORAK Environmental & Occupational Health College of Public Health Gender Effect in Cancer Risk Pediatric Cancer Epidemiology: Fundamental Questions. The Silent Epidemic Uniting to Reduce Infant Mortality. Sheynovo hospital Second Municipal Hospital for Obstetrics and Gynecology “Sheynovo” Plc. celebrates 75 years of traditions, high professionalism and. The risk of Insulin Resistence and Metabolic Syndrome among overweight/obese children born of mothers with Gestational Diabetes Mosca A., Vania A Dept. IMPACT OF PREECLAMPSIA ON BIRTH OUTCOMES Xu Xiong, MD, DrPH Department of Obstetrics and Gynecology Université de Montréal, Quebec, Canada. Jean Amoura, MD, MSc Marvin L.Stancil, MD.  Evaluate how fetal, infant, and childhood development is critical to understanding chronic diseases among. Diabetes Mellitus It is a syndrome characterized by disturbance of carbohydrates, fats, proteins, minerals and water caused by absolute or relative deficiency. Pregnancy And Lactation Copyright 2005 Wadsworth Group, a division of Thomson Learning Life Cycle Nutrition.  Discuss why pregnant adolescents are considered high risk  Special Considerations in regards to  Use of force  Restraints  Transportation  Substance. 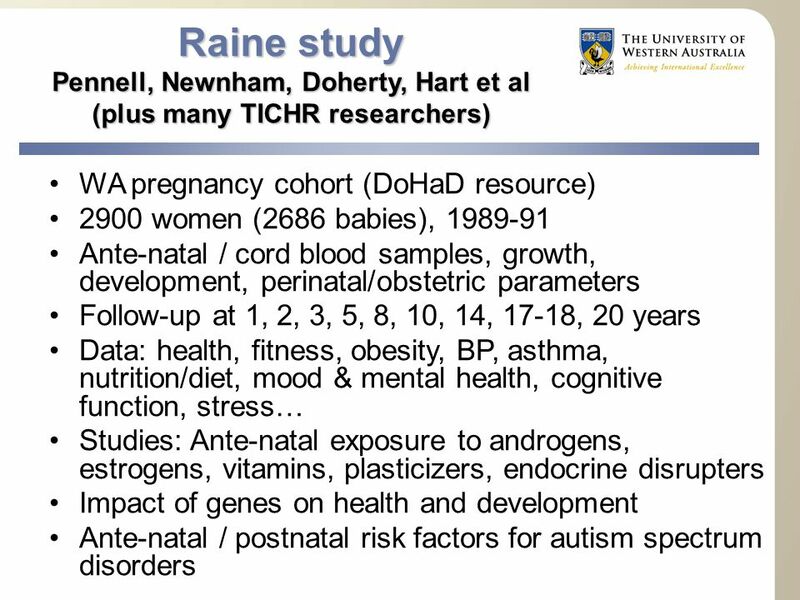 Poor Fetal and Infant growth: Antecedents of childhood obesity Alan Jackson Institute of Human Nutrition Division for Developmental Origins of Adult Disease. Teenage Pregnancy 1 Teenage Pregnancy: Who suffers? 16 February 2011 Dr. Shantini Paranjothy, Clinical Senior Lecturer Public Health Medicine. 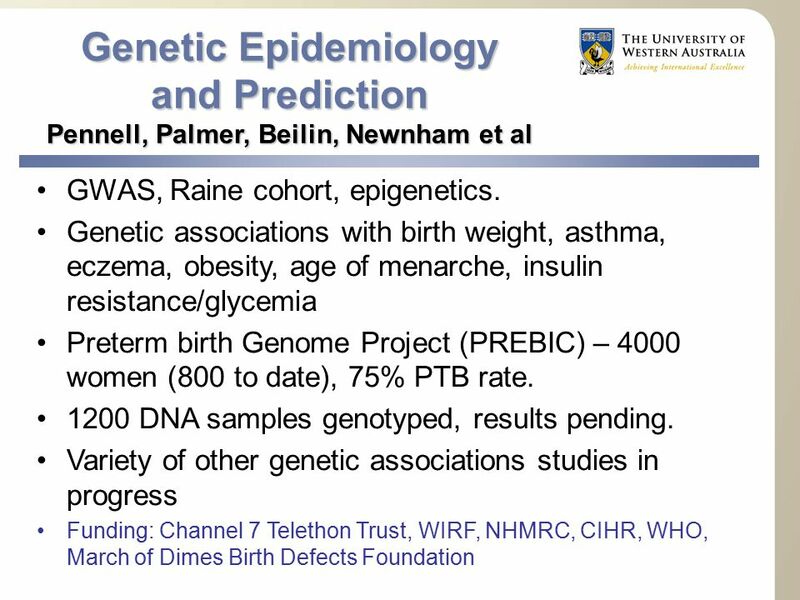 Early programming hypothesis Wilfried Karmaus Reproductive Epidemiology EPI 824. 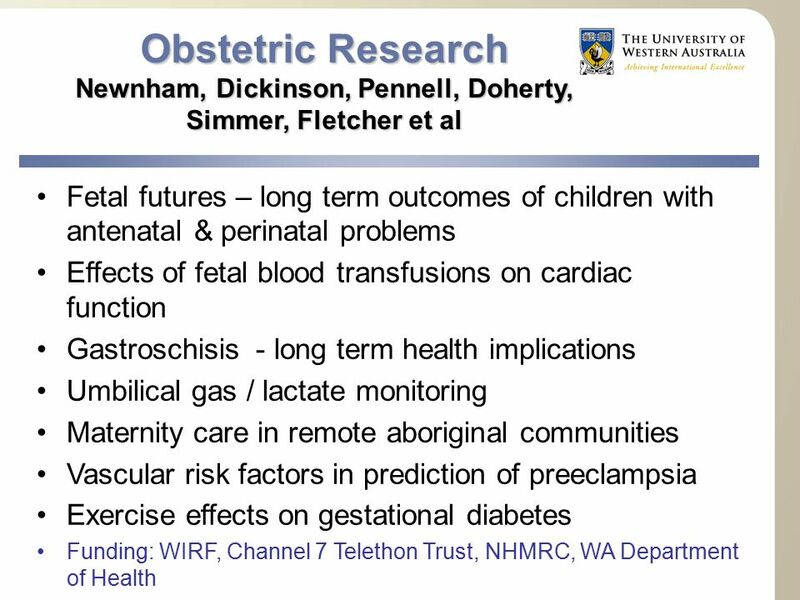 Pregnancy Outcome Prediction Study University Department of Obstetrics and Gynaecology; PI – Professor Gordon CS Smith BACKGROUND The current pattern of. 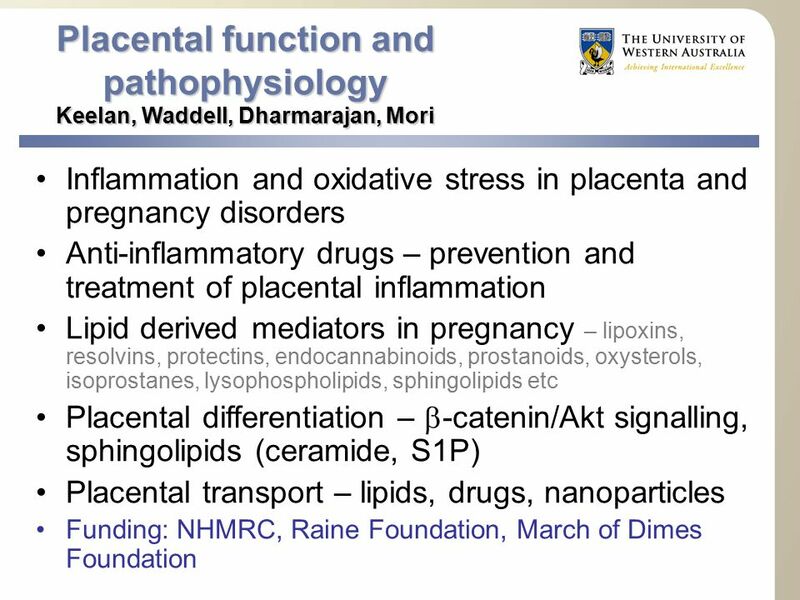 MATERNAL OBESITY MAY CONTRIBUTE TO INCREASED PLACENTAL AND FETAL INFLAMMATION Molecular indicators of stress as indicators of immune status AMANDA JONES. MRC Lifecourse Epidemiology Unit Cyrus Cooper, Director MRC LEU; Southampton 2013.